We all hate textbooks for languages that begin with “Hello, my name …“, don’t we? Our textbooks are made up of a coherent story, which starts very simply, but develops into a fascinating novel. Can’t stop reading? Well then ‒ you will have to keep on learning! We careful selected the most frequently used words in a language and make sure that the story is primarily made up of them. Separate texts and exercises focus on conversational topics that will prepare you for living in the country where the language is spoken. Grammar is a headache? Not with our textbooks. Uncover the structure of a language with pictures, casual yet comprehensive explanations, and a lot of easy to remember examples. Every textbook has its own website with a great number of exercises, a vocabulary trainer, videos about pronunciation, and a whole lot more. 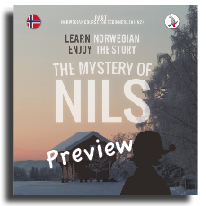 The story goes through both books, but for students with previous knowledge at level A2 it is not necessary to have worked through volume 1 because the story (and the Norwegian grammar) will be repeated at the beginning of volume 2. 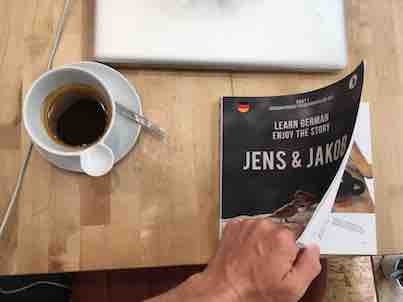 Jens and Jakob are two sparrows living in Berlin. Although the Berlin Wall has been removed for a long time, their life and the lives of the (human) families they are living close to is still affected by the former separation of the city. The tomcat Findus is afraid of humans. When he gets sick, his friend Max convinces him still to seek for human help. Why is Findus so shy, and will he be able to stay with his new family? When Chinese teacher Qi enters his classroom, he finds a horse among his students – Jerry. Jerry is amazing. Despite being a horse, he speaks and writes fluently in Chinese, Japanese, German, and other languages. He also cooks, cleans, listens to music (and to the rain), is romantic, sensitive, gentle … Soon enough, the teacher and Qi move in together and become roommates. Qi thinks about Jerry day and night. Suddenly, there shows up Jerry’s ex, Ronnie, a mule. How will Jerry, Qi, and Ronnie get along? Jerry is a parody on soap operas, a parody on fantasy, a parody on textbooks – but actually, it is a Chinese textbook. Jerry is authored by Piotr Gibas, Associate Professor for Chinese Language and Literature at the College of Charleston, and Grainger Lanneau, M.A. student at the National Taiwan University.